An investigation into what caused a fire in the Assembly Rooms car park has started this morning. Last night, Derby city centre had one of it's biggest fires. 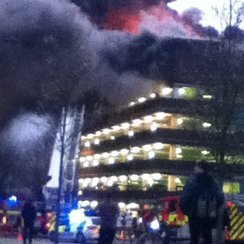 Derbyshire Fire and Rescue were called to the Assembly Rooms around 6 o'clock, where a huge fire had developed on the top floor of the multi-storey car park. At it's peak, eleven fire engines were there putting the fire out, that was scaled back at around midnight to three. Nottinghamshire Fire and Rescue also sent crews over to help. The plant room on the tenth floor of the car park is destroyed but fire crews managed to stop the fire spreading to the Assembly Rooms, though there is some smoke damage. No-one was hurt and no-one was in the car park when the fire started. Drivers with cars inside the car park should be able to get them today but only when the building is deemed safe. Derby City Council have told capitalfm.com that you can call their car park Carelink team to get details about picking up your car on 01332 642201. Officials say if you get charged as a direct result of your car being kept in the Assembly Rooms, then you can get your money back if you have the receipt.